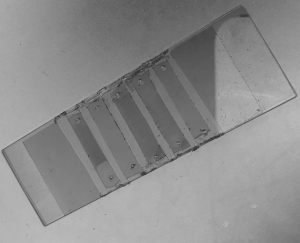 The Slides Production Facility core at Johns Hopkins University produces poly-ethylene glycol (PEG) passivated glass and quartz slides for microscopy. PEG passivated surfaces prevent non-specific binding of proteins and nucleic acids, permitting only specific interactions provided a small fraction of functionalized PEG molecules. Typical PEG-slide production is labor and time intensive, and is a low throughput process producing about 10 slides for a day’s work. We have scaled up the production throughput, producing as many as 60 slides for the same amount of time. Bulk production is also more cost effective. The facility charges $32 for a PEG-passivated quarts slide and glass coverslip pair, far lower than commercially available similar products, which cost $100. This core produces Polyethylene glycol (PEG) passivated quarts and glass slides and glass coverslips to reduce non-specific binding of proteins and nucleic acids. The coated PEG can also be biotin functionalized to allow specific immobilization of biotinylated nucleic acids and proteins via a streptavidin bridge. These slides are suitable for several applications including single molecule imaging. At present, we are able to meet the demands of on an average, 40 slides per week, but home to scale that up soon. The above picture is a typical assembled slide-coverslip pair, with 5 “channels” for flowing microscopy reagents through. The core facility is physically located within the Ha lab in the School of Medicine (WBSB 620). For further information, kindly contact Aditi Biswas (abiswas5@jhmi.edu) or Taekjip Ha (tjha@jhu.edu.